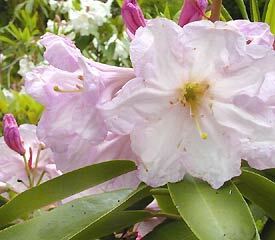 Flower light purplish-pink with light yellow-green blotch in throat, openly funnel-shaped, wavy lobes, 3½" across. Very fragrant, smells like peppermint. Blooms late midseason. Leaves oblong, apiculate apex, rounded base, 4½" long, glossy, olive green, retained 2 years. Upright, open plant habit. Typical height: 4 ft. in 10 years. Plant is cold hardy to 0°F (-18°C). Hybridized by Dexter. 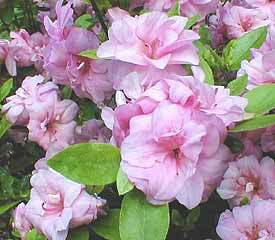 Flower strong purplish-pink, flushed with slight veining of deep purplish pink, broadly funnel-shaped, double, hose-in hose, 1⅛" across. Blooms midseason. Leaves elliptic, 1" to 1½" long, glossy, mid green. Spreading, dense habit. Grows to a typical height of 4 ft in 10 yrs. Hardy to -10° F (-23° C). Hybridized by Gable. Received the ARS Award of Merit and the First Class Certificate from the Royal Horticultural Society. 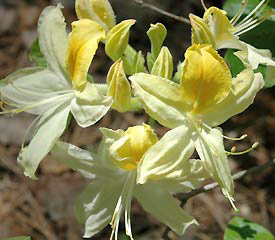 Flower pale yellow with vivid yellow blotch, aging to yellowish white, tubular funnel-shaped, 2⅜" across, fragrant. Ball-shaped truss has 7-10 flowers. Blooms late midseason. Leaves obovate, acute apex, cuneate base, 2½" long, hairy, deciduous. Dense, spreading growth habit. Grows to a typical height of 3 ft. in ten years. Extremely cold hardy to -25°F (-32°C). Hybridized by the University of Minnesota. Photos (top to bottom) by Henk Borsje, Sally and John Perkins, Sally and John Perkins.